Watching the International Space Station zooming across the night sky is truly awe inspiring. Have you ever thought about the technical know-how required to build such a complex research station in space, not to mention the coordination and cooperation needed among peoples of different nations to achieve this feat? I find it fascinating! 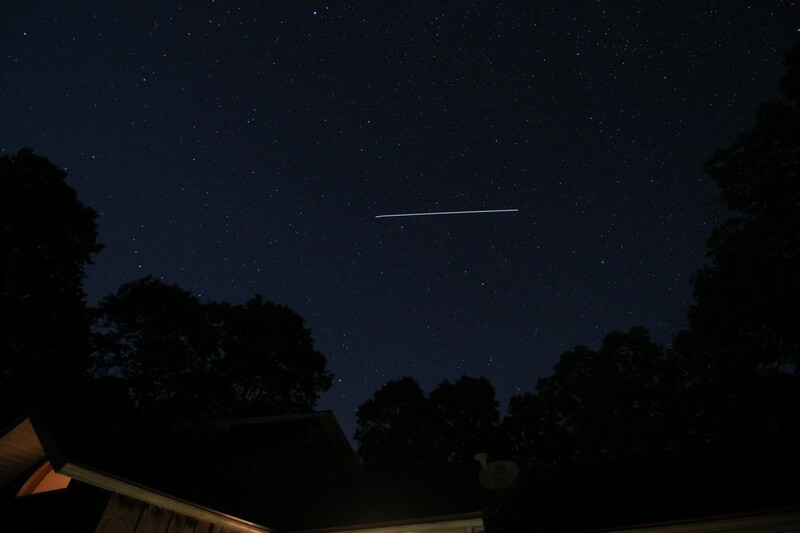 Last night I was so excited to see if I could do this…I had a plan to go out and photograph the ISS crossing the sky. We had a 4 minute viewing window at our location in the mountains of Pennsylvania. With about 15 minutes to spare I got the tripod set up right outside in our driveway and the camera focused in time to capture a couple of 25 second exposures. I was thrilled! 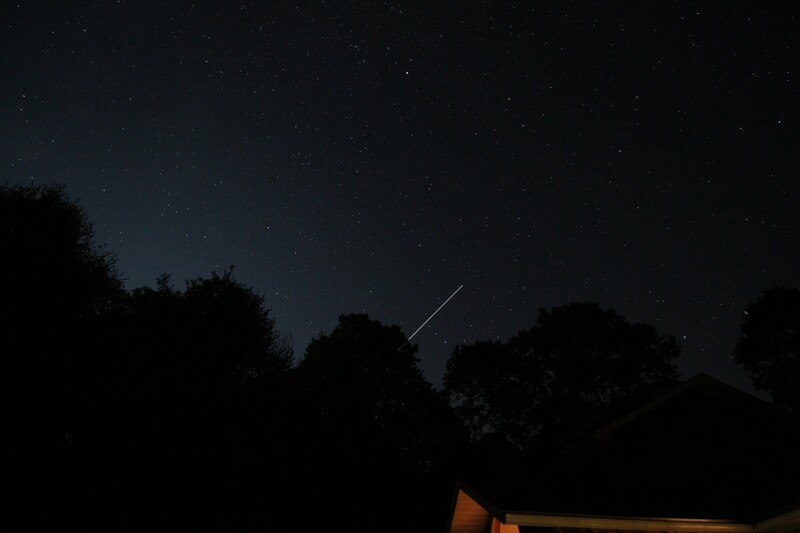 …and the space station as it traveled to the north. Canon T4i camera with wide angle lens EFS 10-18mm, 25 sec., f/4.5, 1600 ISO using a tripod. Looking West, then North at 8:41pm, 26Sep2017. Images were processed in camera using ‘Long exp. noise reduction’ feature in the menu settings, but they weren’t post-processed in any way other than cropping to a much smaller size for posting here and emailing to a few friends. These long-exposure images accent the brightness of this heavenly body, don’t they? 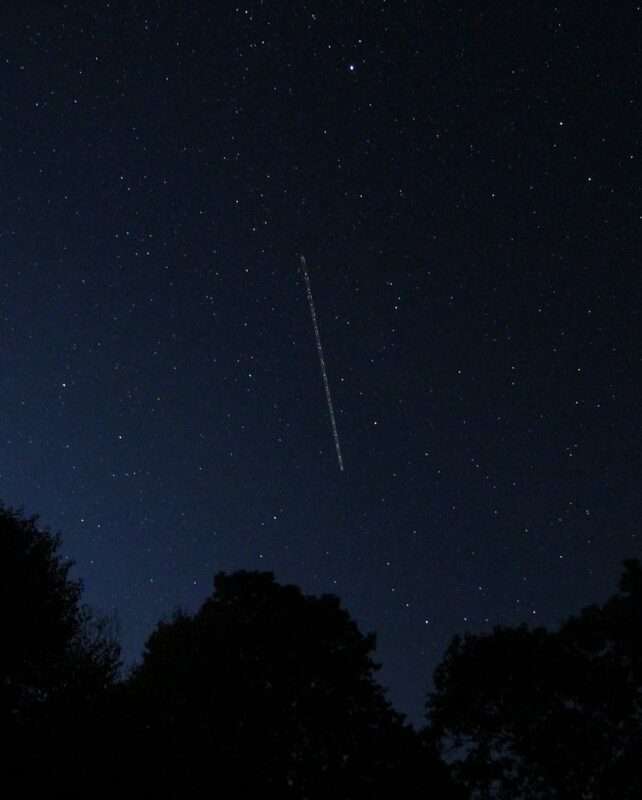 When you look for the ISS you’ll know you’ve spotted it as it’s the brightest moving object in the night sky. And, it moves fast, like 17,500 miles per hour! How did I know where to see the space station? Couldn’t do it without NASA’s Spot the Station website to find out where to look for ISS. It’s also mind-blowing to consider that someone figured out how to calculate where to look to see ISS and when – to the minute – for anyone standing anywhere on Earth! Airplanes will make sound and have flashing lights that distinguish them from satellites, including the space station. With their proximity to Earth airplanes only reach 600 miles per hour or so, so they move slowly compared to ISS. Blow up that image and you’ll see the intermittent red and green dots across the path of the plane. Those are the flashing lights that let us know it’s de plane! Most satellites don’t have huge solar panels that reflect sunlight back down to Earth like ISS so they appear faint in photographs. 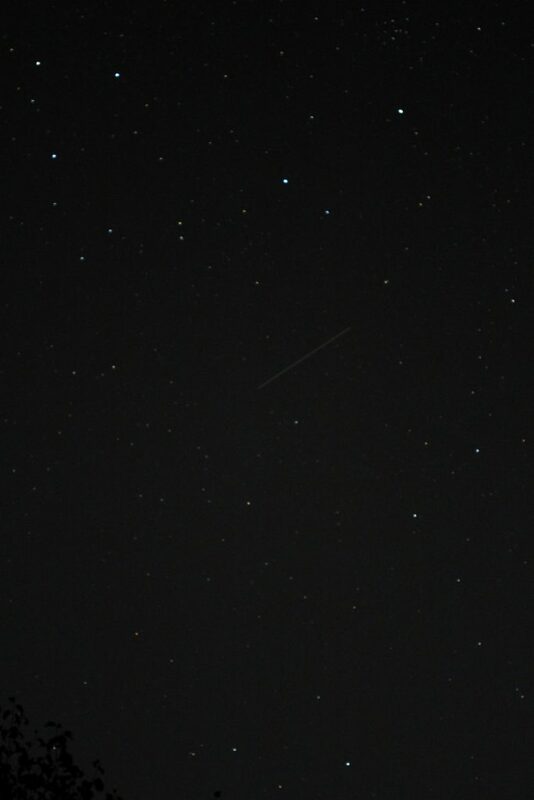 You can still see satellites with the naked eye, but you do need to concentrate your gaze in one direction. So, the next time you’re out after dark, look up at the stars and see what else is out there!